When concepts get tough, content gets visual. Marketing diagrams are a fast way to explain interrelated concepts and tricky ideas. Nothing makes a muddy post clear like a good visual. 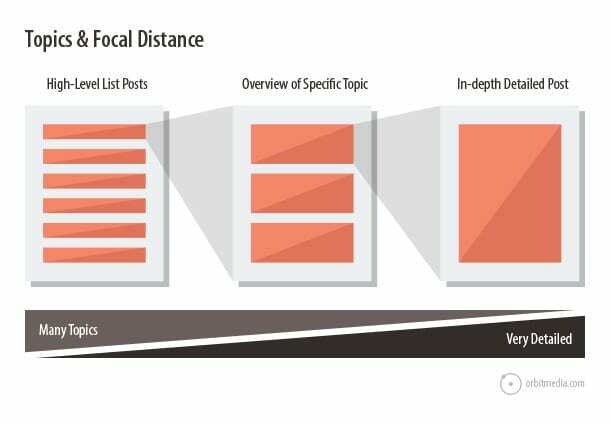 You can use this to guide your marketing, making sure to publish at various levels: the big picture highlights and in-depth posts. Be sure to link your posts together into content hubs. Touch on the many aspects of a general problem or solution. Cover the various aspects of one specific concept with complete, but basic details. A detailed description of a specific problem with thorough answers to questions and step-by-step instructions. Some content makes a strong impact. Some content lasts a long time. Unfortunately, they’re usually not the same content. Face-to-face interaction is ideal, forming the strongest connections and building the greatest trust. Text is sadly the weakest format at conveying tone and nuance. Some last just for that moment, passing in real-time. Social media posts may be accessible for years, but they are only highly visible for minutes or days. Search optimized post are often highly visible for months or even years. Combine formats for greatest impact. Add video to high-ranking posts. Turn content from live events into posts that can be shared. Things that are different stand out. They’re unlike the things around them so they get noticed. On web pages, color is a great way to make something obvious. On an all-blue website, a spot of orange jumps out. It’s more visually prominent than something green. This is because, on a blue page, orange is more different than green. It’s farther away from blue on the color wheel. Some colors are warm (red, orange and yellow) and some colors are cool (blue, green and purple) In a cool context, warm visuals are more prominent and vice versa. 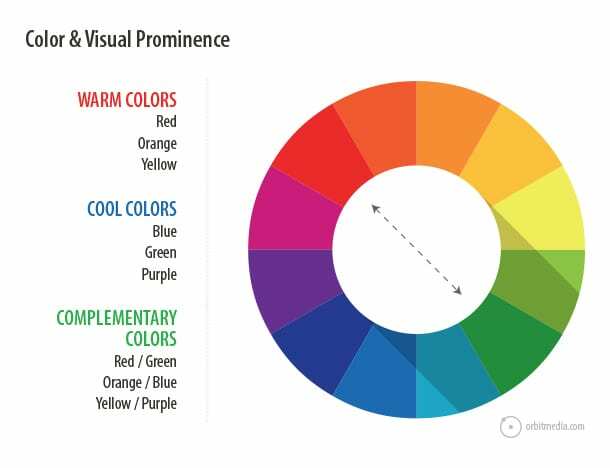 Two colors that are on opposite sides of the color wheel are called “complements.” These combinations have the strongest contrast and, therefore, can create the strongest visual prominence. Use color to draw attention to important items, like offers, buttons or calls-to-action. Basically, content marketers do three things: make stuff, promote it and then measure. Simple right? But what happens when our content reaches our audience isn’t so simple. Different members of our target audience are at different stages. They may be aware of us, but not really considering us. They may be considering us, but not ready to act. Or they may be on the verge of taking action, either following us on social media, subscribing to our newsletter, or becoming an actual lead. Google is a discovery engine. High rankings for a relevant phrase can have dramatic impacts on visits, branding and awareness. Social media also increases awareness, since it makes you visible to friends of friends. And that new person follows you, you’re content appears in their streams. They’ll begin to consider becoming more engaged. Email signup requires a higher level of trust. But when they do subscribe, you begin reaching them consistently. You’ve move beyond simple awareness and toward greater consideration and action. Let’s look at the side-view of the same funnel. 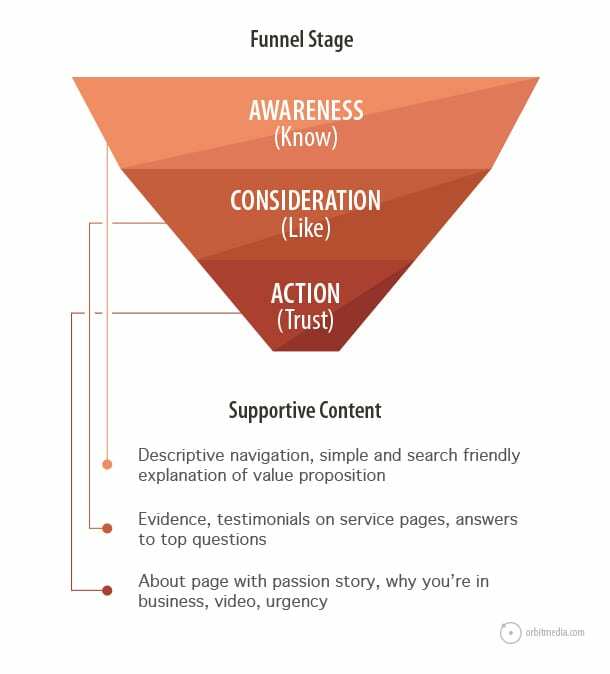 Now you can see how different types of content and support different stages in the funnel. Awareness: Use simple, search-friendly descriptions of your products and services. Make sure these descriptions are in your navigation and title tags. Also, consider writing list posts. Consideration: Add evidence of legitimacy to your pages, such as testimonials and statistics. Make sure you answer all of your visitors questions or they may look for answers elsewhere. Action: Tell your passion story. Explain why you’re in business and why you care so much about what you do. Upgrade the format of your content to video. Give visitors a reason to take action soon. Different actions have different outcomes. 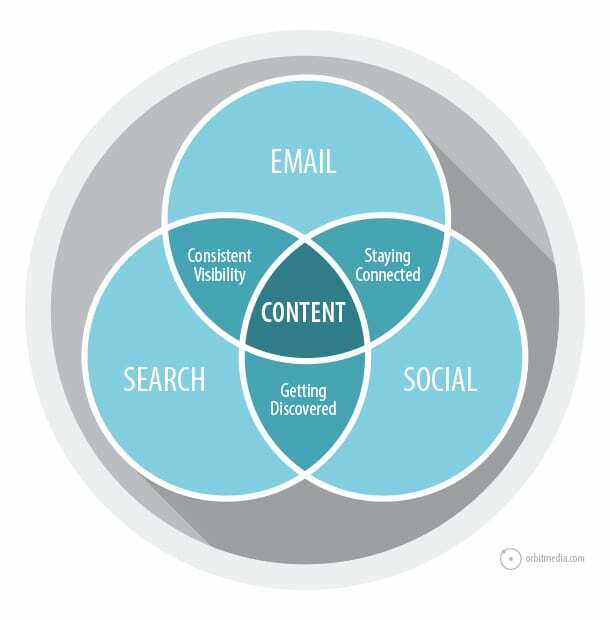 The content promotion channels (search, social and email) are distinct, but they have overlapping benefits. There’s more than one way to reach a goal. Here are three goals/outcomes and the corresponding marketing channel for each. For best results, look for issues in your analytics then combine tactics to address the problem. If overall traffic and % new visitors are low… use search optimization and social media. Both of these channels have the ability to make your brand easier for new people to find. If overall traffic is up and down… use search optimization and email marketing. These two channels both can create steady streams of visitors. If traffic to your blog, and percent of % returning visitors are low… use email marketing and social media. Email and social have the ability continually to reach an audience that is already aware of your brand. 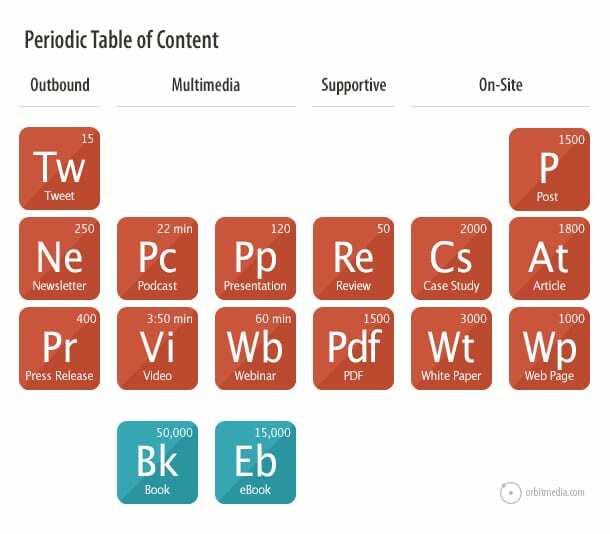 This post wouldn’t be complete without adding the Periodic Table of Content. This is an updated version of the chart that lent its theme to our book, Content Chemistry. 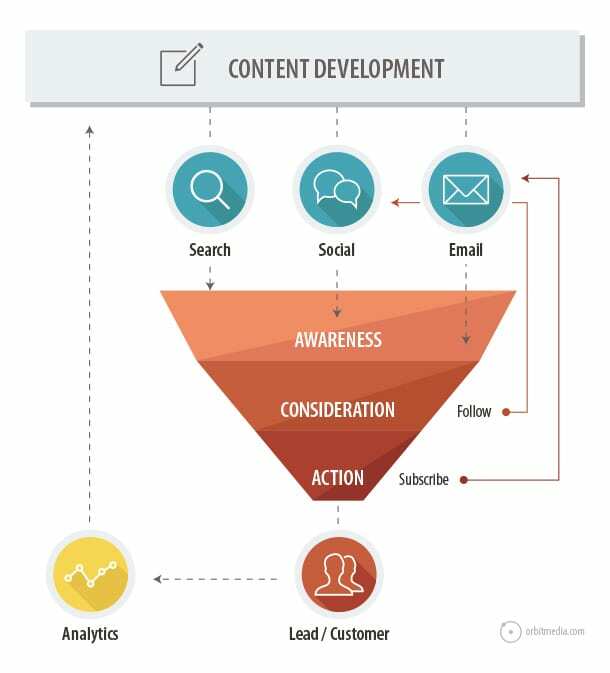 This is part of a guide for repurposing content from one format to another. Atomize larger formats of content into smaller formats. If any of these diagrams help support a message in your marketing, feel free to take them with you before you go. We’re happy to share. Just be sure to refer back to this post. This is great Andy. 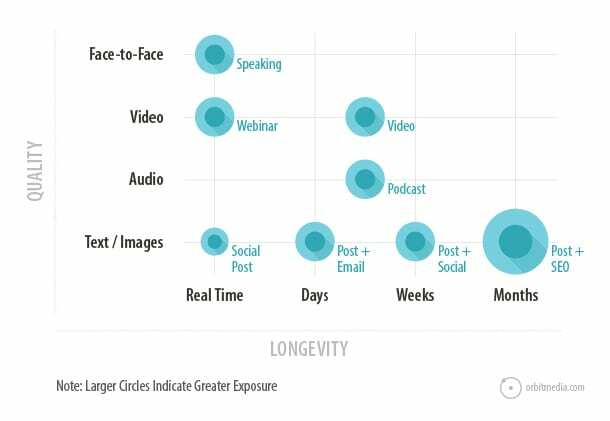 My favorite is where you put Social in the Impact/Longevity segment. I have been doing research lately about social and blogging about it. I will take 1 email subscriber over 50 Facebook Likes any day. 1 Authoritative Link = 20 Email Subs = 150 Twitter Followers = 250 FB Likes. Sorry I didn’t publish these sooner, Kim! Some of these have been in my notebooks for years. Thanks for visiting, Kim. Nice to see you here in the comments! Insightful. My favourite was ‘Periodic Table of Content’ and would want to see a detailed version of that part. Thanks. It’s a fun visual, but the post is very practical. I hope you find it useful! Thanks Andy. Chock full of smart and useful information, as usual. And now I know what a fractal is! That fractal concept is relevant to a writer like you, Danny. Zoom in or out and you’ll find topics a-plenty! Glad you liked this one. Thanks for the comment, as always! I love this – great blog, thank you!!! This is a great post, but it makes me wonder what other goodies are hanging out in your notebook! My favorite is #2, Content Quality & Longevity, closely followed by #1, Focal distance and #5, Content and Conversions. BTW, how hard would it be to add a “Printer Friendly” feature to your blog, so I could easily view and compare multiple images at once? Thanks, Roger. I agree about #2. It has the most to say. But the idea of “focal distance” is simple and important, especially for an author like yourself. I didn’t emphasize it here, but the concept of fractals and focal distance is also the secret to blogging your way into a book. Do you agree? I don’t think it would be hard to make a print-friendly version. Actually, if we made a Slideshare presentation from these, it would be downloadable, print-friendly and embeddable. Adding that to my to-do list! These are really good, Andy! Hey Andy! !Always something Different in your article to learn!Great efforts!